In 1930, Washington and Lee's Board of Trustees granted a request from the United Daughters of the Confederacy (UDC) to display original Confederate battle flags from different regiments of the Army of Northern Virginia in Lee Chapel near the statue, "The Recumbent Lee." The flags had been either captured by or surrendered to the Union Army during the Civil War and held until 1906, when the secretary of the U.S. Army ordered their return to the Confederate Memorial Literacy Society (CMLS), in Richmond, Va., which ran the Confederate Museum (later called the Museum of the Confederacy and now part of the American Civil War Museum), also in Richmond. The CMLS, in turn, agreed to loan eight of the flags to the UDC for display in Lee Chapel. Four additional flags came to the chapel from private donors for display and interpretation in the Lee Chapel Museum. Charles Cotesworthy Pinckney, of Richmond, the son of a Confederate army officer, had suggested a display of battle flags in Lee Chapel to the UDC after seeing French battle flags at Napoleon's tomb in Paris. Pinckney donated two brass standards bearing an inscription to his father, Capt. Thomas Pinckney. Neither Pinckney nor his father was affiliated with the University. When the display was introduced, the flags were placed on either side of the entrance to the statue chamber. Later, they were moved into the chamber itself but were still in two groups of four flags in the brass standards on the floor. In 1963, A. Prescott Rowe, then the museum curator, observed that the flags were deteriorating. He wrote that "the natural inclination of most visitors to touch and feel the time-worn material necessitate their relocation to bronze wall holders for the sake of preservation." In 1993, the Museum of the Confederacy asked that the University return the flags because of their deteriorating condition, and the original flags were replaced by reproductions in 1995. Meanwhile, the University entered into an agreement with the Museum of the Confederacy that called for the flags to be placed in a vault and to be restored during the next decade. Following restoration, the University was to display "the restored flags, and only the restored flags" on a rotating basis and under glass specially designed for the flags. 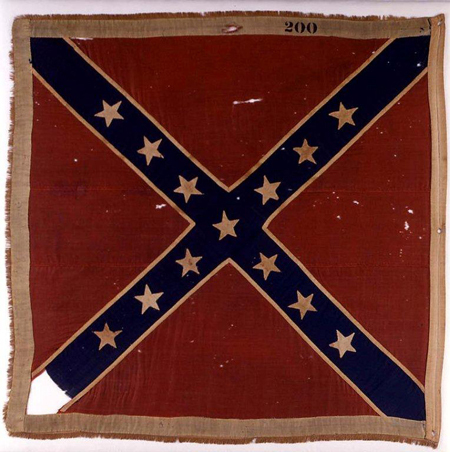 Due to space considerations at the time, W&L was unable to fulfill its obligations to display the restored original flags, and the Museum of the Confederacy asked that they be returned to Richmond; that took place in March 2005. The reproductions continued to be displayed in the brass wall holders in the corners of the chamber until 2008 when the original bronze standards donated by Pinckney were discovered in storage. The Sons of Confederate Veterans funded the reproduction of the staffs, which permitted the return of the originals to the Museum of the Confederacy. The flags were then placed back in the standards and moved from the wall mounts back to floor display. When the museum was remodeled in 2007, a changing exhibition space was created, which allowed space to display the flags as originally intended in 1997. In August 2014, responding to concerns that members of the W&L community raised about the appropriateness of the display of the reproductions, the University removed them, thereby returning the statue chamber to its originally intended design. At the same time, the Lee Chapel Museum began a collaboration with the American Civil War Museum to display restored original flags, on a rotating basis, in future exhibitions. The following descriptions of the flags are based on information from the American Civil War Museum and from research conducted on the Lee Chapel Museum's behalf by the late H. Michael Madaus, an expert at the Milwaukee Public Museum on Civil War ammunition and flags. The U.S. War Department in Washington, D.C., held 545 captured Confederate flags, which were numbered and occasionally had data about the circumstances of their capture on tags sewn onto the flags. The flags are identified here by the numbers given them by the U.S. War Department. 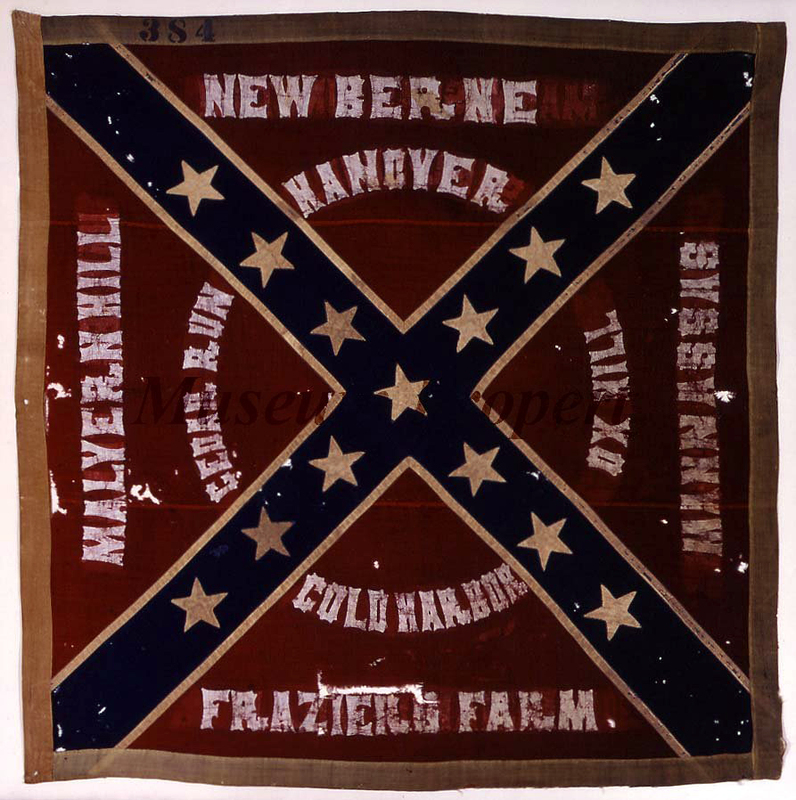 This flag was captured at Bristoe Station, Va., on Oct. 14, 1863, by the 82nd New York Infantry or the 19th Maine Infantry. The North Carolina Regimental Flag belonged to either the 15th, 46th or 48th regiment of the North Carolina Infantry. 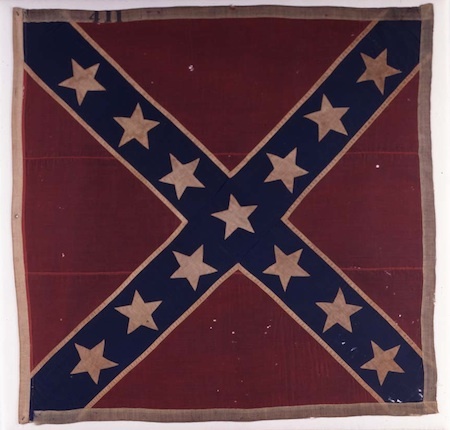 Captured at the Battle of Gettysburg on July 3, 1863, by the 12th New Jersey Infantry, this flag is believed to have belonged to the 26th North Carolina Infantry. A history of the 26th Infantry records the following report on the incident in which the flag was captured: "Our color bearer, a member of Company K, Facuett's Company from Alamance County, succeeded in passing over this fence, but fell mortally wounded. He died that night with his face to the enemy. Our colors fell with our brave color-bearer not ten steps from the rock wall." July 3 was the last day of fighting at Gettysburg. 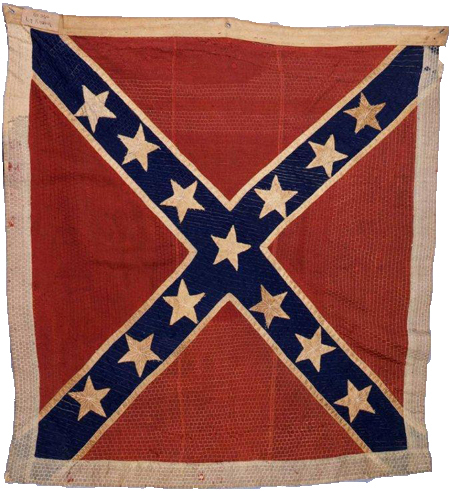 Captured at the Battle of Gettysburg on July 3, 1863, by the 12th New Jersey Infantry, this flag is tentatively identified as from the 47th North Carolina Infantry. The incident surrounding its capture is recorded in the report of Major John T. Hall: "At 4 p.m. on the third instant, the whole line became engaged in repulsing an attack in force made by the enemy, completely routing them, and capturing prisoners estimated to number 500 men, and 2 colors." Cpl. Thomas Anderson of the West Virginia Cavalry captured this flag of an unidentified unit at Appomattox Station, Va., on April 8, 1865, the day before Gen. Lee accepted Gen. Grant's conditions of surrender for the Army of Northern Virginia. 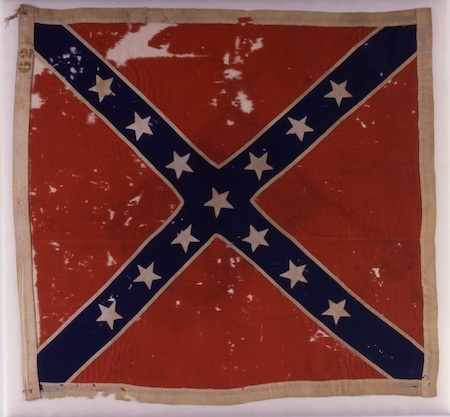 This flag is currently included in the Museum's Changing Exhibition, "Lee in the Field." 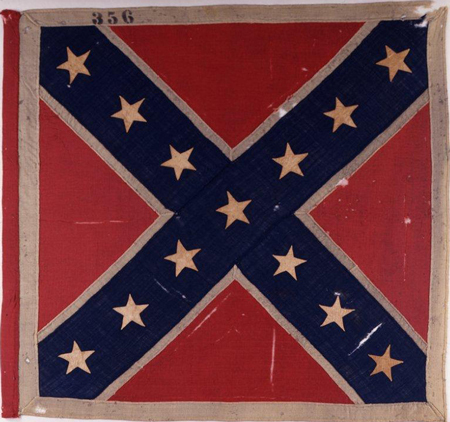 This flag is tentatively identified as having belonged to the 3rd Arkansas Infantry. 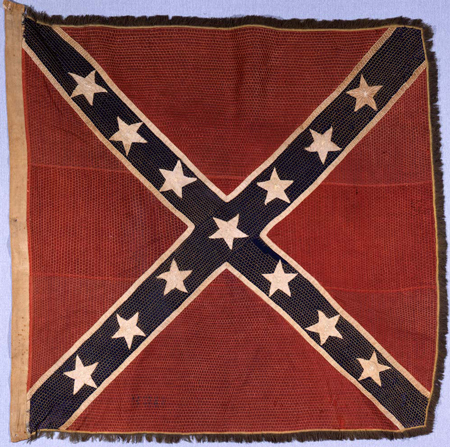 It is the battle flag of Field's Division, Longstreet's Corps, and was believed captured during the Appomattox Campaign in April 1865. A note left on the flag staff read: "Mr. Yankee, you will please return this flag staff and shoulder belt over to the ninth Maine." The note was signed "Big Rebel." Cpl. 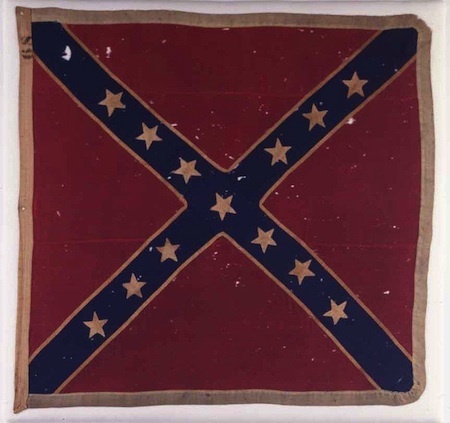 Richard Welch of the 37th Massachusetts Infantry captured this flag, tentatively identified as belonging to the 37th North Carolina Infantry, near Petersburg, Va., on April 2, 1865. Capt. Archibald Hopkins recorded the incident: "In the assault on the enemy's works at Petersburg on the morning of April 2, 1865. . . . Corporal Richard Welch, Company E., knocked down the rebel color bearer, took his flag and shot one of the gunners while in the act of discharging his piece. For his capture of battle flag number 384, Corporal Welch was awarded the Medal of Honor." The flag features battle honors painted onto the standard, naming the battles in which the flag had flown. 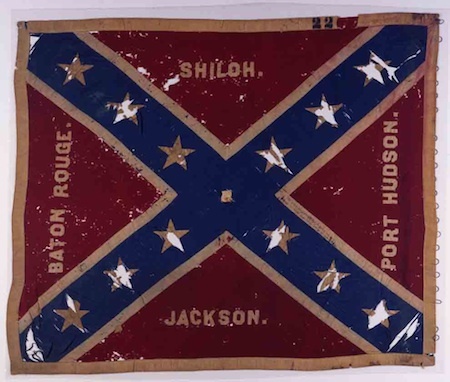 George Meach of the 6th New York Cavalry received the Medal of Honor for his part in capturing this flag at the Battle of Winchester on Sept. 19, 1864. The flag is from an unidentified unit that was tentatively part of Gen. Gabriel C. Wharton's Division of the Virginia Infantry. President Abraham Lincoln's son, Tad Lincoln, brought this flag from an unidentified unit to Richmond, Va., on April 4, 1865. Tad accompanied his father on his visit to Richmond. It is unknown whether this flag was captured or surrendered. 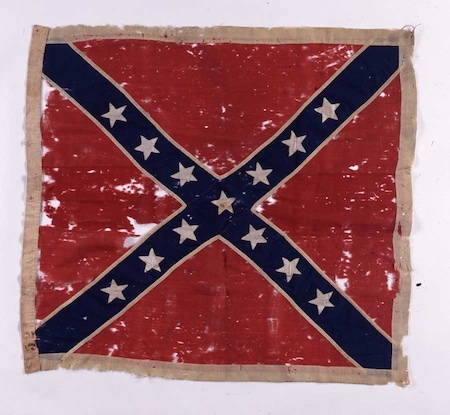 This flag of an unidentified unit was among the flags captured or surrendered during the Appomattox Campaign from April 2 through April 9, 1865. Pvt. Charles A. Taggart of the 37th Massachusetts Infantry captured this flag of an unidentified unit at the Battle of Sayler's Creek, Va., on April 6, 1865. 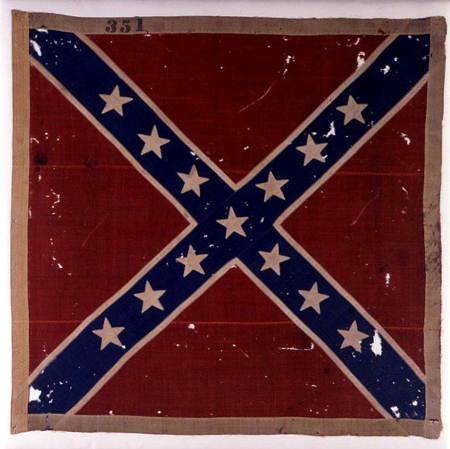 This is a South Carolina regimental flag captured at the battle of Weldon Railroad, Aug. 21, 1864, by the 5th U. S. Army Corps. 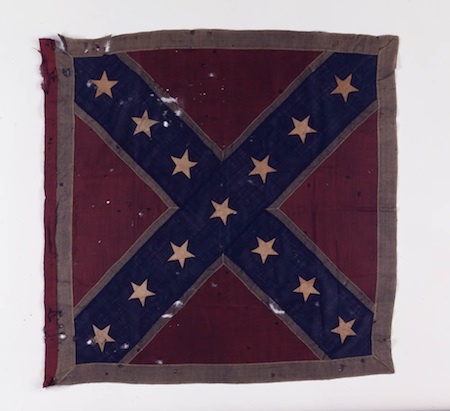 This flag is probably from the 3rd Kentucky Mounted Infantry and was captured at Richland Creek, Tenn., December 16 or 17, 1864.